The need has never been more crucial for community health providers, programs, and organizations to have access to training in addressing the unique behavioral health challenges facing our veterans, active duty military, and their families. 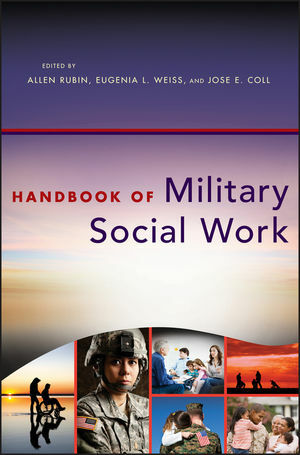 Handbook of Military Social Work is edited by renowned leaders in the field, with contributions from social work professionals drawing from their wealth of experience working with veterans, active duty military, and their families. Offering thoughtful advice covering the spectrum of issues encountered by mental health professionals working with individuals and families, Handbook of Military Social Work will contribute to the improvement of efforts to help our military personnel, veterans, and their families deal with the challenges they face. Allen Rubin, Ph.D. is the Kantambu Latting College Professorship for Leadership and Change at the University of Houston Graduate College of Social Work. He is the author of a number of bestselling titles in social work research and the past president of the Society for Social Work and Research. Eugenia Weiss is a Clinical Associate Professor in the School of Social Work at the University of Southern California. She is a licensed clinical social worker and a licensed psychologist. Weiss assisted in developing the USC's military social work sub-concentration and teaches a course on military families. Her research interests include diversity and multicultural training in social work education and family attachment issues through the phases of military deployment. Jose E. Coll is an Associate Professor in the Department of Social Work at Saint Leo University and Director of Veteran Student Services, where he has been a faculty member since 2011. Prior to joining St. Leo, he was a Clinical Associate Professor and Chair of the Mlitary Social Work & Veterans Services at USC's School of Social Work. Coll is a Marine Corps veteran who served with 1st Force Reconnaissance Company. His research focuses on counseling practices with veterans, cognitive development and cognitive complexities, and underage college substance abuse.